This popular recreation destination is named for its likeness to a kneeling camel. 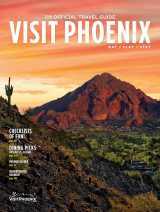 And for some of the best views in the city, you’ll need to clamber onto its 2,700-ft “hump.” Camelback’s two challenging trails end in an uninhibited 360° panorama of Greater Phoenix and beyond. If you’re planning a visit, know your limits as a hiker, bring plenty of water, and spare some time to sit back and enjoy the view from the top. Wind and rain have eroded two holes in this unique red sandstone hill in Papago Park. The hole in the “ceiling” afforded the early Hohokam civilization a way to track the sunlight, and the larger chamber serves as a great viewing portal for the modern hiker. Climb inside to watch the sun set on the downtown skyline and beautiful desert landscape. 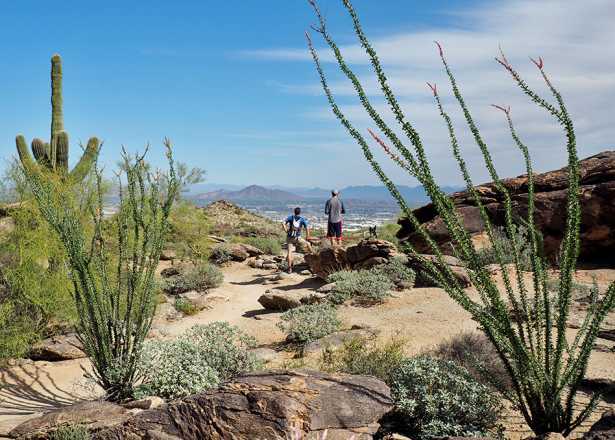 At the highest accessible point of the South Mountain Preserve, you’ll find panoramic city views and a stone ramada perched on the edge of a 2,330-foot vantage point. Hike to Dobbins Lookout on the 2.5-mile Holbert Trail, or take the easy route by car. At this north Phoenix favorite, the cuisine is matched only by the views. 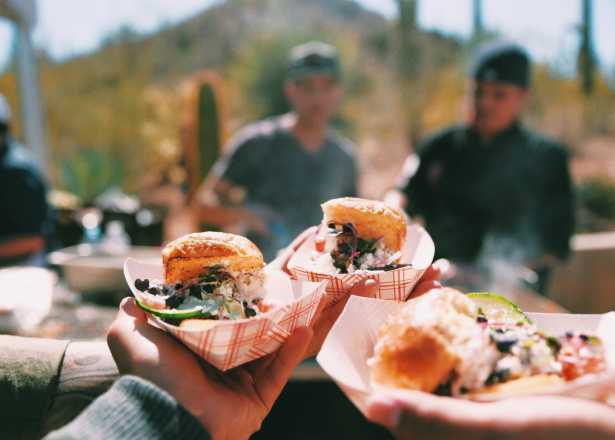 Take in the surrounding mountain preserve, downtown skyline and South Mountain from both the patio and dining room of Different’s mountaintop locale. 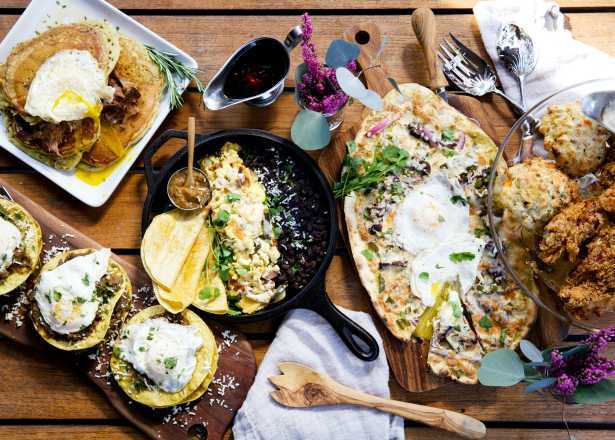 Take a tour, go for brunch, or feast upon a steak dinner at the Wrigley Mansion. Located in the Heights of Biltmore neighborhood, the estate looks out upon groups of other Biltmore homes as well as the Downtown and Central Phoenix skylines. Once fabled to be a hideout for cattle rustlers, this mountaintop perch now serves up country Western grub and a spectacular scenic overlook. Enjoy dinner on the patio or indoors—the steakhouse’s interior north-facing wall is all glass windows, so no one misses out on dinner with a view. 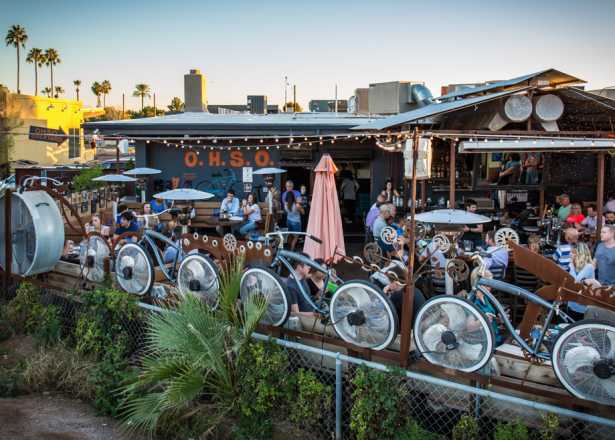 This hip deck—once awarded the title of Phoenix’s favorite “hang out” spot—offers skyline views and a place to lounge with friends as the sun sets. Get a 360-degree view of the city without leaving the dinner table at Compass Arizona Grill. There’s not a bad seat in the house at this rotating restaurant atop downtown’s Hyatt Regency Phoenix hotel. 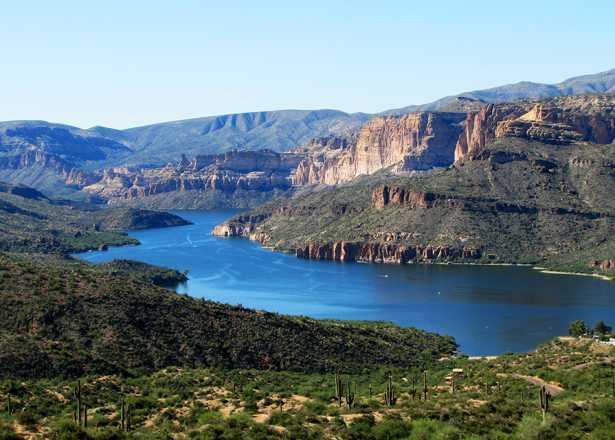 Conquer the second highest peak in the Phoenix Mountain Preserve and you’ll be rewarded with a panoramic view of the entire Greater Phoenix region. The semi-intense 1.2 mile trail will leave you breathless (from the view) at the finish line. 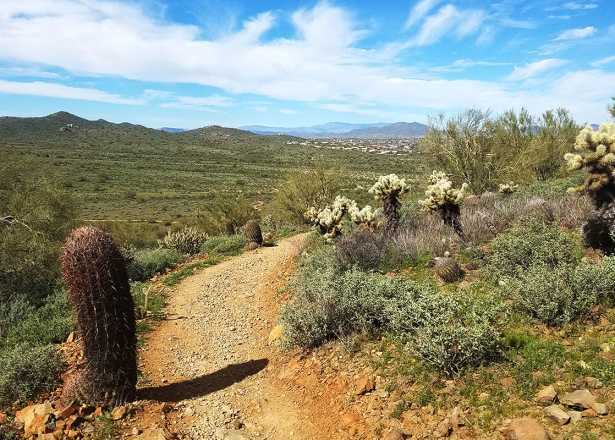 Get your blood flowing on a smooth desert trail that allows you to get up close and personal with some of the desert plants and views of North Scottsdale and the surrounding area. Enjoy the city views from Lustre, a shady oasis on Hotel Palomar’s 3rd floor deck, while you sip on a cocktail or take a dip in the rooftop pool. Dine on Talavera’s patio for a locally-sourced meal and dramatic desert vistas from the foothills of Pinnacle Peak.